When the University of Wolverhampton constructed its new £25 million science block, the energy efficiency of the new facility was of utmost importance. The University has set ambitious targets as part of a five year Sustainability Strategy and this was a valuable opportunity to improve the site's environmental performance. The resulting variable air volume (VAV) air management system supplied by TROX for the new science block has enabled the University to make significant strides towards these targets, by improving carbon footprint in the most energy-intensive part of the university. The company chosen to supply the high-efficiency air management system for the Rosalind Franklin Science Building was TROX UK – an international manufacturer of components, devices and systems for the ventilation and air conditioning of rooms, with specialist expertise in air management for laboratories. 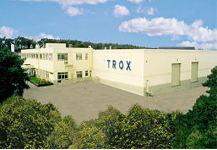 TROX installed its EASYLAB room air management system (to optimize the energy efficiency of supply and extraction of air in the laboratories), in addition to Variable Air Volume (VAV) controllers for the building's central air conditioning and cooling system. TROX also analysed the air terminal device requirements of different zones in the building, installing the best possible designs of grilles and diffusers to maintain the optimum learning environment for students and staff. Further information about EASYLAB can also be found here.